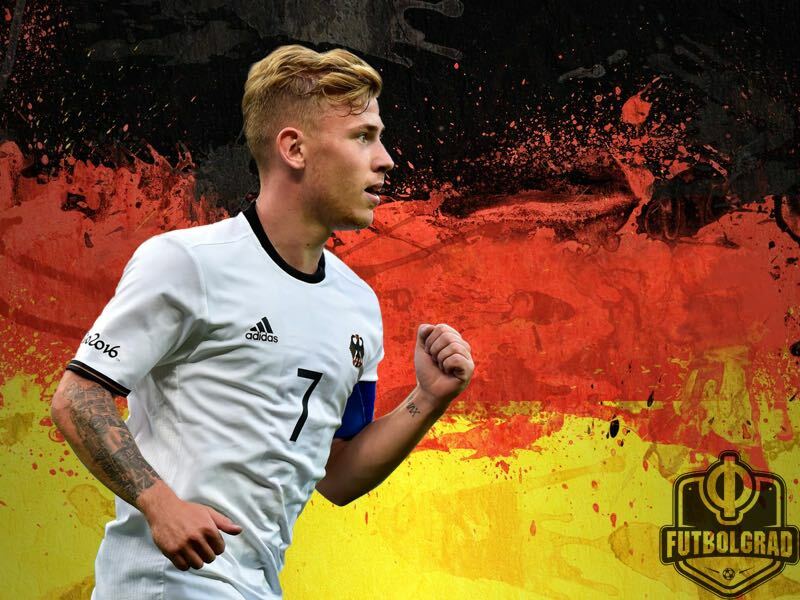 Max Meyer and Serge Gnabry secured a perfect start for Germany at the U-21 European Championships in Poland on Sunday night. Germany’s starting eleven against the Czech Republic has 520 starts in the five big European leagues between them, only slightly fewer than Spain. Therefore it should not come as a surprise to you that Germany were considered as the favourites coming into this games against the Czech side managed by Vitezslav Lavicka. However, the game was more than open in the first fifteen minutes. After just five minutes, Germany registered their first huge chance following a passage of play, which would turn out as Germany’s most common attacking pattern is this match. VfL Wolfsburg’s Yannick Gerhardt picked up the ball on the left flank and laid it off to Germany’s striker Davie Selke, who immediately played the through ball to Bayern’s new signing Serge Gnabry. The young winger managed to beat his opponent and tried to grab an early lead from the left side on the six-yard-box but missed the target narrowly. Following this early chance, The Czech attackers constantly pressed the Germany defensive line – especially Kaiserslautern’s goalkeeper Jannik Pollersbeck, who was Germany’s only starter without top flight experience. The 22-year-old goalkeeper nearly lost the ball to the Czech star striker Patrik Schick, who earns his living in Italy. This seems to be common among German goalkeepers, who tend to keep hold of the ball for too long too often. Unsurprisingly, Pollersbeck seemed to be very nervous following his sloppy start and failed to find his man on multiple occasions while trying to build-up from the back. This however wasn’t an uncommon problem in the opening minutes as both teams didn’t manage to stay in possession for a longer period, which resulted in an open and hectic football match. Twenty minutes in, Germany started to settle this game down due to Maximilian Arnold’s and Mahmoud Dahoud’s ability to dictate the play from midfield. 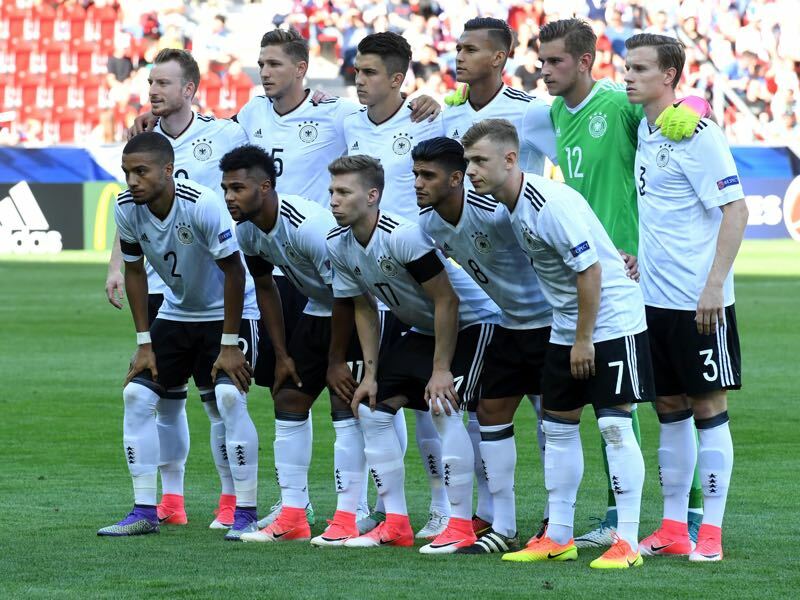 Germany’s midfielders often tried to find Gnabry or Gerhardt on the left side of the pitch and managed to shut down the rare offensive initiatives from the Czech attackers on the other side of the pitch. Germany’s opening goal was initiated from the left side, but it was their attacking midfielder, Max Meyer who broke the deadlock in the 44th minute after a quick switch of play from Mitchell Weiser. Meyer was unmarked on the left side of the penalty area and could simply finish off a great piece of play with a shot into the long corner. However, it has to be mentioned that the goalkeeper Zima could have done better considering that Meyer’s shot crossed the line close to the goalkeeper’s original position. After the break, Germany controlled this game and looked very dangerous on the counter attack. They’ve opened the second half with a huge double chance from Davie Selke and Mitchell Weiser before Serge Gnabry doubled their lead in the 50th minute. A long ball from Maximilian Arnold was accidentally touched by the Czech right-back Michal Sacek, which allowed Serge Gnabry to get on the scoresheet with his third chance of the game finishing with an easy volley from close range. The game cooled down after that and it was obvious that Germany were happy with the three points. Due to Shick’s movement and hold-up, the Czech side created scoring opportunities on two occasions in the 57th and 63th minute, but Schick and Janko failed to open up the game again. Schick, who was the top scorer in the U21 Euros qualifies had a couple of chances in the final minutes of the game as well, but couldn’t life up to the pre match hype and couldn’t test Pollersbeck’s reflexes. Six minutes before the final whistle, a cheap was handball given away by Janko, which allowed Zima to make up for his previous mistake by denying Davie Selke from the penalty spot. In the first game of the U21 European Championships Germany managed to underline their ambitions with a strong performance against a disappointing Czech side; it was a massive result for the German team captained by Maximilian Arnold, which is now one step closer to the knock-out stages. The next game for Germany’s U21s will take place on Wednesday evening against Denmark before their final group stage encounter against another favourite to win the tournament—Italy. Gegenpressing – Bundesliga Podcast – Mbappé to Bayern?